And that will be that for a day where Arsenal reached a 19th FA Cup final - an English record. What would this one say? Joy, ecstasy, pain, agony. What a game we were served. What a display by the underdog - a recurring pattern in the FA Cup this season. And what a moment of calamity to decide things. Who do Arsenal fans want to face in the FA Cup final on 30 May? Sho: Villa. Cannot stand Liverpool fans. Besides, Villa could do with a cup final considering the season they have had. An aside from the Wembley result, one keen eyed viewer has spotted something uncanny. Ben Brownleetweeted us on #bbcfacup saying: Great show and match GaryLineker but are you turning into Des Lynham!? Reading boss Steve Clarke: "It's not a case of being robbed, it's about getting what you deserve from the game. The effort and the tactical and technical discipline was there. You feel for Adam Federici, this is the life of a goalkeeper. The big mistake. If you lose, you want to lose to a moment of brilliance not a mistake. But I'm sure if you did a shortlist of top three players at Reading this season, he would be up there. I told him [after the game] to keep his head up. The mistakes will freshen his mind. We win as a team and lose a team." Former Reading chairman Sir John Madejski talking to the BBC: "I'm so proud of Reading and the fans must be delighted and now we have to concentrate on our league position. It's always a case of what might have been and to have lost that goal just before half time of extra time but it bodes well for the future of Reading football club and we live to fight another day. "I think we played well above our level against an in form Arsenal. We'll be back and it's just a matter of time until we lift some silverware, we were always going to be underdogs and at the end of the day the best team won and the players and fans should be very proud." Who would you like to face in the final Arsenal fans? Liverpool or a resurgent Aston Villa? Tweet us on #bbcfacup. Arsenal manager Arsene Wenger on the performance of Alexis Sanchez: "He struggled to get into the game but has that stubborn resilience and individual potential." I'd hate to see the damage he would cause if he did get into the game. Reading manager Steve Clarke: "It was a really good performance, I feel for the players they gave everything, feel for the supporters they gave everything. It should have been a good afternoon for us but sometimes in football you do not get reward for such a good performance. "The second-half we grew into the game and found belief and found a bit of quality to get back into the game. It is a good job there was goalline technology otherwise I am not sure they would have given us the goal. ; We should have had a penalty in the 65th minute for a handball. You need these moments to go for us. "Federici is upset, he had made a mistake in a key game but he is a strong personality and has been magnificent for the club all season. Without his saves we would be in even more trouble at the bottom of the Championship." Reading manager Steve Clarke tells BBC Radio 5 live goalkeeper that Adam Federici has been taken to doping control. It's fair to say probably not what the stopper needed. "He will be sat on his own without anyone around him," former Hull City midfielder Kevin Kilbane tells BBC radio 5 live's 606. The two games in which Ozil has laid on two goals have both arrived since March. The German international played 114 passes, that's more than any other player on the pitch. He completed 90.4% of them. A stellar display. Arsenal manager Arsene Wenger says Reading were ready to "die" on the pitch, such was their effort for 120 minutes. "It was a very difficult game against a well-organised, physical and resilient Reading team," he says. "They defended very well. "After half-time we didn't have the same intensity in the first half. We started to suffer and paid for it. "Reading were ready to die on the pitch to get to the final and we have to congratulate them on their effort today." Those campaigns came in 1998, 2003 and 2014. Arsenal goalkeeper Wojciech Szczęsny, who is celebrating his 25th birthday today, said: "I am happy we are through but I thought Federici was terrific today. He had the game of his life and they only got to extra time because of him. He was the best player on the pitch. I really feel for him, I have been there, done that." Szczesny's mistake allowed Birmingham's Obafemi Martins to score the winner in the 2011 League Cup final at Wembley. "I am pleased with the win but I am distraught for Adam Federici. I would rather win on penalties. It is something you don't get over. He has to close his legs and get his body behind the ball. It is harsh but that is it. "What is more upsetting is when Arsenal are playing these teams they start so slowly. It is disappointing to see them play like that. "Winning the FA Cup will be a fantastic way to end the season for Arsenal." The lines are open for 606 with Kelly Cates and Kevin Kilbane. They want your reaction to Arsenal's extra-time victory over Reading at Wembley to reach the FA Cup final. Leicester are of the off the bottom of the Premier League for the first time since November - can they pull off a great escape? After Chelsea's win over Manchester United - is that the title completely over? We also want to hear from fans of Bristol City, who were confirmed champions of League One and Burton Albion - who were promoted from League Two today. BBC 606 on Social media. James.Pheney: Lucky as per usual from Arsenal. Even Neuer made a mistake like Federici a few weeks ago. Come on Reading!!!!!! Ben Chowns-Smith: Got to feel for Federici. It was a bad error but he's still human. Hard to see someone leave the field in tears. Zahid: Michael Hector did us all proud! What a performance! The Fresh Prince of East Ham, this won't be the last we see of him! That last Alan Shearer entry sent a shiver through me. Imagine spending the rest of your life being reminded of your most embarrassing moment. Sport at its most brutal does not hurt you physically but will pollute your very being for eternity. "It's not nice to see when it comes down to one individual, Adam Federici will remember that for rest of his life and people will mention it to him for the rest of his life. He actually played very well but it's agony for him, the players and the fans. But one thing Steve Clarke would have said to his players is to give everything, not to leave anything on the pitch and they did that." This is a picture of the man of the match. Alexis Sanchez picked up 70% of the vote. Two goals, 75% of his passes completed and three chances created. He mucked in alright. Arsenal manager Arsene Wenger speaking to BBC Sport: "A tough game yes. They defended well and we didn't find our stride. They were strong in challenges and we struggled to win 50/50s. They were on a different planet for motivation. It is a semi-final and it does not go easy. A team like that, the occasion of their life, and they will not give up. "We controlled the first half comfortably but they came into it second half. We started flat but they were more aggressive and we lost more balls. "When you are in the final you can win it. We will prepare well, finish well in the league and then come back here and do all we can to win it. We all want a trophy. It is difficult to deliver but all you want is the attitude." The numbers show Arsenal's upper hand but none can sum up the calamitous circumstances in which their win was sealed. Arsene Wenger's side played 851 passes to Reading's 314. While Reading may draw plaudits for their battle, the Premier League side won more duels on the day, 96 to 71. "You have got to say Reading put in a spirited performance and at times they matched Arsenal. They rolled their sleeves up, they were honest and committed but overall the best team won. "Arsenal had that extra bit of quality and it showed, they have played better in the last two months but they are in a final and have a chance to win it but they will have to play better against either Liverpool or Aston Villa." Images of Adam Federici before he raced down the tunnel make for uncomfortable viewing. He is absolutely distraught. Arsenal midfielder Aaron Ramsey has swapped shirts with the man who was best man at his wedding Chris Gunter and tells BBC Sport his side were "made to work" for their progress. "We knew it was going to be a tough game but they came out and showed great character to come back into it," says Ramsey. "We were on the ropes at times but dealt with it and had a bit of luck with the last goal. "On these occasions things like that happen but Reading made us work for this today." Lee Allen: Got to be one of the cruellest ways to concede and so harsh on Federici as he made some stunning saves. Tomas Austin: I'm an Arsenal fan and even I feel bad for the Reading keeper. There will be tears. They will belong to Reading fans and Adam Federici will cry his own river. What a way to exit. Arsenal will contest their 19th FA Cup final on 30 May. Alexis Sanchez shoots in pursuit of a hat-trick but the wall does its job. Arsenal have around 90 seconds to go. Win and they are the most successful team in FA Cup history with more trophies and final appearances combined than any other side. Now it is kitchen sink time. Get that ball forward if you want to prolong this one Royals. They do but Jamie Mackie is flagged offside. Arsenal probe. No sign of them shutting up shop, not in their make-up. Michael Hector foils Theo Walcott. He has been outstanding at the back for Reading. Have we reached kitchen sink time? Maybe not yet, another minute or two. Reading need to pepper that Arsenal area with trouble. Chris Gunter gets forward from full-back but cannot deliver a cross under pressure. Reading's supporters look concerned. The songs seem to have dried up for the first time today. Wonderful stuff from Mesut Ozil as he sparks an attack with a deft backheel then collects a return from Aaron Ramsey to slip in Olivier Giroud... shot... post. The angle was getting tighter with every millisecond and Giroud rattled the near post. Reading look on bleary eyed as Arsenal keep possession for a spell, drawing any unwanted sting out of this game with every nudge of the ball. Yakubu is on for Pavel Pogrebnyak who has been a nuisance today, maybe that change is a bit surprising. Reading have to make free-kicks like this count, it's in the Arsenal half, up come the big men and one gets a flick on it but Wojciech Szczesny is brave and punches as he jumps over bodies. "I think the keeper will put his hand up there, he could have done better. It was a tired shot from Sanchez to the near post and the keeper spills the ball. You have to feel sorry for Reading for the effort they had put in." Adam Federici has made seven saves today, Wojciech Szczesny - three. What will the papers say about this? Lucky? A let off? Would a third goal at least gloss over some Arsenal fortune? Mesut Ozil has a go but pulls a shot wide from the edge of the area. Left footed, it's wayward. So what have you got Reading? You may as well throw everything at this now and Jamie Mackie does, shooting over from 25 yards. "Adam Federici has played well, made some excellent saves, but that's a howler. I genuinely feel sorry for the lad. It took a slight deflection, but it is still no excuse." "The goalkeeper will never forget something like that. But I don't feel like the game is over." Moments ago Adam Federici made a hash of an Aaron Ramsey shot but got out of jail, this time he is punished and it's tough to watch. Cruel, brutal, horrible. Alexis Sanchez cuts in from the left flank, he wants shooting space in the area but when it arrives the effort is tame. An easy pick up? Nope. It squirms through his body, trickles over the line and Federici sinks to the turf. Magical cross-field pass by Santi Cazorla finds Kieran Gibbs who crosses, well cleared. Pavel Pogrebnyak will compete for that punt and does well, he races into the area but his effort is blocked. Adam Federici's heart just leapt into his mouth and dropped back down again. He makes a meal of Aaron Ramsey's strike from 30 yards and parries the low drive over his bar. That ball could have gone anywhere. Mesut Ozil with a beautifully disguised pass to find Alexis Sanchez but Nathaniel Chalobah springs to rattle the Chilean's cage. He gobbled that ball up, great defending. And after much build-up, Francis Coquelin departs for Theo Walcott. That's a deep midfielder sacrificed which will probably see Santi Cazorla drop back a touch. Karl Simmonds: Reading superb, Arsenal below par. But where is Theo Walcott? Arsenal Crew: Extra time is screaming for Walcott with his pace. David Kent: My nerves will not last another 30 minutes. You can also text us in the UK only on 81111 - but please don't forget to include your name and location. "I'm still baffled by the fact we have not seen Theo Walcott for Arsenal." We will in a moment. Feed the Yak? Yakubu is on the bench for Reading, chewing away. He sniffs goals and looks a great option. Reading are so well organised. A back four, three bodies in front of it, then another two, then Pogrebnyak. Again it does the job as Arsenal are forced to go long and Olivier Giroud is offside. Reading again get bodies behind the ball as Arsenal build slowly. The architects - Mesut Ozil and Santi Cazorla - are deep, that will please the Championship side and they pounce to win the ball back through Jem Karacan. "This period is a little bit like the beginning of the game again. Reading look tired and are letting Arsenal dominate the ball. Steve Clarke's side have to lift the tempo." LaurenLola: Arsenal have definitely underestimated reading! Premier League Player of the Month doesn't join the pitch till 70 minutes in. Why?! Olivier Giroud has already had two shots since his introduction. Former Reading chairman John Madejski is sat with a blue scarf on and a worried look on his face. He is engaged in conversation with FA chairman Greg Dyke. Hopefully that's not the cause of the worry, it's probably the antics of his beloved team. Mesut Ozil with a delicate flick on to Olivier Giroud as Arsenal inject some pace into an attack but it's not under the Frenchman's spell and Reading's narrow back line clear. The diligence and awareness of Reading's defenders has been superb all day. They see danger coming like a missile detector. "We have waited 90 minutes for Arsenal to get going. Arsenal should be beating Reading, but Reading should take a lot of credit. Arsenal will have to do more to win this." And so we go again. Reading attack the Arsenal end. They have two substitutions to make, Arsenal just one. Who has more in the tank? "Reading have been magnificent, they have given everything to the cause and deserve the score line. They have worked their socks off, created chances, defended well and deserve to be where they are. They had one hell of an opportunity now I hope they don't regret it. "I get the impression they thought all they had to do was turn up to win the game, They have been leggy and sloppy other than one or two pieces of brilliance. Other than that they have not offered a lot, their passing has been slow and they have been punished." They want your reaction to the outcome of the FA Cup semi-final between Arsenal and Reading. If Chelsea go on to beat Manchester United - is that the title completely over? "We did say earlier that there will be times in the game when Reading will be able to sit off and coast for periods, trying to conserve some energy, but when they have got in Arsenal's face they have been committed and the plan has worked perfectly. The only question now is will fatigue kick in?" "Arsenal have been very disappointing today. Reading will have to work hard as Arsenal will have a lot of possession in extra-time, but Reading do deserve something. Once again when Arsenal are overwhelming favourites they do not get out of the blocks quick enough." Arsene Wenger is hunched down on the ground with his troops circled around him. Santo Cazorla is sat down, shin pads out. There is a tired look about the Spaniard. Here is his touch map. More touches than anybody else. Arsenal fans, penny for your thoughts. Championship opposition at this stage a year ago, extra time needed, second tier opponents again, same outcome. What a brave Reading display in the second period. Last chance. Free-kick Arsenal swung in by Santi Cazorla and Olivier Giroud can only head into the hands of Adam Federici. Chance again for Arsenal and it's Aaron Ramsey with the opportunity to win it for the Gunners. It was tougher than his previous one but a good one nonetheless. Kieran Gibbs makes progress down the left and crosses for the Welshman who can only divert over the bar. Big chance. In fairness to Pavel Pogrebnyak, on first sight he could have used the two versus one advantage but Jamie Mackie looks so leggy he barely made a run for him. This is pulsating stuff. Pavel Pogrebnyak on the ball, midway into the Arsenal half, it's a two versus one situation but he will go alone and his touch is poor and costs the Royals a golden chance. What an end to this 90 minutes. "What a fantastic counter attack to break through the middle of Reading's defence. I thought Aaron Ramsey was going to go down at first but he stayed on his feet and I thought his shot was in - like everyone did. How did he hit the post?" I just said Aaron Ramsey was quiet. The crashing sound his shot against the post just made has shaken me to my boots. What a chance, some may say what a miss. The midfielder bursts forward to collect a pass and is in behind the Reading defence, inside the area, goal at his mercy , his first shot is saved but as the rebound falls and the angle narrows, he smashes the woodwork from six yards. Nathaniel Chalobah cuts in from the left flank and has a dip... it is a dip indeed as the ball moves in the air and Wojciech Szczesny has to dive to his right to save well. "Arsene Wenger looks very frustrated. He's walking up and down the touchline as if to say, how are we drawing this game? Steve Clarke is shouting at his team, barking orders for them to keep their shape." Santi Cazorla on 90 touches is undoubtedly the man who makes Arsenal tick. He starts another attack, caressing the ball wide to Kieran Gibbs. Aaron Ramsey has been quiet and he tries to bulldoze his way through Reading. No way through Rambo. Not even with a nickname like that. Jamie Mackie is wrestling with a defender, a mini war, the ball breaks free and Pavel Pogrebnyak will drive at the Arsenal area, he again shows decent pace but a left-foot strike from a tough angle will dribble across goal. If Arsenal progress today they will top the list for FA Cup final appearances on 19. Jamie Mackie pumps up the Reading fans with a war cry, not that they need it. What a display they have produced in this second period. Much more of the ball with far more intent. Can Arsenal get Olivier Giroud into the game? THEY CAN... but Alexis Sanchez puts too much on his return pass and the Frenchman will not catch that. "Gabriel has to hit the target from there. He was only six or seven yards out - that header has to go in." Wow. Gabriel may have the name of an angel but this effort is anything but heavenly. The substitute somehow ghosts into space as Mesut Ozil delivers a free-kick, he must score, unmarked, eight yards out, just glance it... he gets too much of the ball and it's high and wide. This competition continues to throw up absorbing games this year and with 18 minutes left, where is this latest drama going? Danny Welbeck departs, Olivier Giroud finally gets the nod. With 30 touches, Welbeck saw less of the ball than anyone in his team. "He has made a run across the front post, there was no man there to stop him, but what a brilliant save that is. A superb save from a brilliant header from Gabriel." Super-sub Gabriel... no. A brilliant run to meet a corner and he heads it with some force at the top corner but Adam Federici dons his Superman costume and palms the ball up and on to the bar. Superb play all round if you overlook the marking. What a chance. A shot at glory but a shot that dribbles well, well wide from American Danny Williams. The ball rolled across his path 18 yards out with a clear sight of goal but he caught it badly. Head in hands time. "The game is crying out for someone like Theo Walcott. It would be so easy for an Arsenal player to make the pass that he could race on to with his pace." "HANDBALL. HANDBALL." The shouts go up as Reading attack. Their fans behind the goal are making some noise. Mathieu Debuchy was the offender on two occasions in their eyes as he blocked crosses from Hal Robson-Kanu. One of them was right on the edge of the area, arguably in it, a tough and close call. "The league title is as good as done, but the FA Cup is wide-open. Arsenal are under the cosh." follow a live text on that one here. Belete Eshetea: That is why Wojciech Szczesny is our number two goalkeeper! Kurt Booth: Szczesny looks off vacantly into the distance after that goal... probably at his career evaporating. He should have saved that. lfcway: Reading deserve that. Game on! Jay: Who needs a Plan B if you've got Wojciech Szczesny in the opposition goal. Arsenal's first change is not Olivier Giroud, it's a problem at the other end as Per Mertesacker limps to the touchline like a sulking child. Head down, he looks angry. Gabriel is the man coming on. Like for like. "It will be interesting to see what Arsenal do now. How long will it be before somebody like Olivier Giroud comes on?" Former Arsenal goalkeeper Bob Wilson is in the crowd. He was of course in goal when they lost at the semi-final stage to unfashionable Sunderland in 1973. I wonder if he's getting a bit hot under the collar. Danny Welbeck is offering a selfless run into the left channel and his hold up play brings Mesut Ozil into the fray, he shapes to play another clever pass but it troubles no one and rolls for a goal kick. Hands up if you saw that coming? Mine is certainly down. Are Reading going to do a Bradford, Blackburn or Middlesbrough and rumble one of the big boys? Arsenal settle after the goal, it's slow build-up across the back line though and Reading players just occupy their zones diligently to form a compact unit. "It started with Mathieu Debuchy losing the ball sloppily. Then the throw-in, but it was good play from Pavel Pogrebnyak to Garath McCleary, it took a deflection off Kieran Gibbs but Wojciech Szczesny should have done a lot better. He needed to be stronger." "It's a very well worked goal and Reading have been much better since the restart, but for me Wojciech Szczesny should be saving it. I think it's the deflection that puts him off. The ball comes off Kieran Gibbs and bounces up very awkwardly. "Reading are on the front foot and are starting to enjoy their football now. They're not letting Arsenal dictate the pace of the game anymore." Go on Steve Clarke, celebrate. Don't be a misery. Your side have just levelled up an FA Cup semi-final. You can manage more than a fist pump. It's a goal full of hard work, just like his side have been in large parts. Pavel Pogrebnyak holds off a challenge and for a big man, shows turn of foot to get to the dead ball line and clip a cross across the face of goal where Garath McCleary stretches to volley in. It's crossed the line has it? Yes. Confusion over, he races to celebrate and a line of players chase to wrestle him to ground as one half of Wembley erupts. Hector passes into midfield, into Williams, on to Robson-Kanu, this is nice stuff from Reading, it flows. Left-wing position for the Wales international, he crosses but that's woeful and clears the crossbar. "With Olivier Giroud in the side Arsenal tend to play much quicker up top. Danny Welbeck doesn't maybe have the same strength as Giroud has and as a result they seem to prefer to go wide. Arsenal can still go another 10% or 20% better than they are doing at the moment." Garath McCleary takes off like a slalom skier down the Reading right, leaving crossing space is he? No. Too many red shirts. But the attack remains, down goes Pavel Pogrebnyak looking for a free-kick on the edge of the area. Nothing doing. Mesut Ozil gets a decision on halfway though, much to the audible frustration of those wearing blue. "Reading are never going to beat Arsenal by trying to play the better football. Steve Clarke's side need to hustle them, break the play up and get the ball forward a bit quicker. When they did get decent possession in the first half they tended to waste it." Michael Hector is involved a lot again in the Reading defence. A massive up and under to clear is quickly followed by a trip on Alexis Sanchez. He just could not live with a clever touch. A crossing chance for Santi Cazorla and Per Mertesacker senses another Wembley goal but he diverts the ball wide off his back. He threw his head at it but judged the flight of the ball wrong. Here we go again. A huge section of seats on halfway are empty as the teams get things going again. The shade has moved so Arsenal's defenders will again be under it. And Reading win an early free-kick in the oppositions' half. Kurt Booth: Sanchez demonstrated in that finish the kind of dead-eyed calm he has brought to Arsenal which has helped settle a nervous team. Rishi Verma: A shame Reading aren't able to make more use of the ball in the final third of the pitch after working so hard to retrieve it. Jordan Cole: How average have arsenal looked but give a player like Sanchez half a chance and he'll take it. Patrick Coppins: That is what a combined £75million gets you. Pure class from Ozil and Sanchez. "Reading have been very brave, they've played a very high line. Arsenal interchange brilliantly and as soon as they get in behind your midfield, you're vulnerable. Steve Clarke's side started very well, I thought Jamie Mackie was really unlucky to have been given offside. They just need a little bit more care and belief. The manager will be in there now trying to inspire his players, because these opportunities don't come around very often." "I was hoping Reading would begin in the way they did. They were compact and organised and pressured Arsenal. But you can't do that without leaving space in behind. For 39 minutes they performed so well but Mesut Ozil, with a little bit of quality, has undone them. There will be chances for Reading though." Ozil has been busy picking the ball up all over the final third as he drifts around. His 58 touches is only bettered by Santi Cazorla's 62. "In fairness to Reading I thought they were brave to play two up front. Not a lot of teams do that against Arsenal and they got tight on them. Steve Clarke's side acquitted themselves well but that one bit of quality for the goal was top drawer. On the whole though Arsenal will be disappointed in the way they have played. For 39 minutes they were poor. Lethargic and sluggish." Arsenal have had 74% of the ball but much of the play has been in midfield with Reading working hard to cut out balls into the final third. The Gunners made just six tackles in the first half. "They have done well Reading, they have to be careful to not feel sorry for themselves and take the positives out of the half. They have not been in lots of trouble, they have been defending for their lives courageously. They will get a chance in the second-half." "That goal was tough on Reading but it had been coming with Arsenal continually knocking on the blue door. It needed a magical pass to unlock that Reading defence and now at half time it is the Arsenal fans who can sense yet another FA Cup final. Reading have 45 minutes to find a way back into this game." Nevereagle: Who else? Wenger's best purchase ever? Alexis Sanchez had 35 touches in that opening period and ultimately had the most important one. He completed 79% of his passes. Mesut Ozil is on 94%. Steve Clarke needs to get his team sorted out because their concentration is dropping. Has Clarke got a plan B? If he doesn't you can really see Arsenal running away with this." Those are the margins I guess. A half full of fight and on times rush defending by Reading ends with a brief lapse in concentration, a well-timed run and potentially a decisive moment. What now? Does Steve Clarke call for more attacking intent and risk watching the horror of his side being picked off? As the half draws to a close Nathaniel Chalobah blots his copy book with a tackle on Kieran Gibbs. It's a bruiser, not dirty, but enough for a yellow. "You can't keep good players quiet. Sanchez has been frustrated up until now but what a great finish that is, how calm he was. It was the first opportunity in front of goal. There was a patient build-up, with a packed defence and a brilliant pass from Ozil. That's the quality you get. Sanchez was a little bit fortunate, the shot just popped through the keeper's legs." Danny Williams is at the sharp end of the break in the Arsenal penalty area but he cannot volley a dropping ball on target, it dribbles well wide of goal. That's 21 goals for the season for Alexis. His reward? A naughty little foul by Danny Williams who leaves a little bit on his man when the ball has gone. "A class goal from a class player. It was a lovely ball in from Mesut Ozil, and Alexis Sanchez provides a quality finish. His movement and his touch is so good. Reading just have to keep it tight until half-time now." 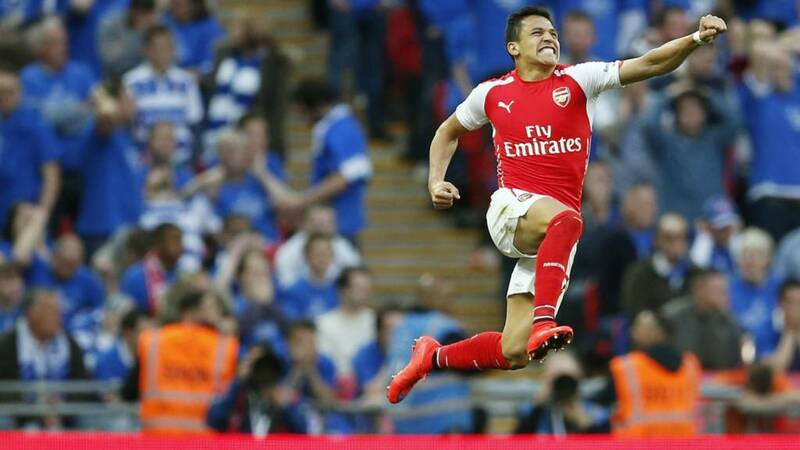 Alexis Sanchez makes the sign of the cross, he has a goal at Wembley and it oozes quality. Quality in the build-up as Mesut Ozil shapes onto his left foot 40 yards out and curls a ball over the centre of the Reading defence to find the run. It's there to bang but Sanchez resists and wrong foots the covering defender. A pause, a prod of his right foot, it's under Adam Federici from around 10 yards and that is a big, big goal at a great time for Arsenal. "Steve Clarke will be relatively pleased with Reading's start. They're compact and organised and Jamie Mackie is providing his side with a threat up front. Clarke spent much of the opening 20 minutes patrolling his technical area barking instructions as things quieten down at Wembley." The snippet of sun that penetrates Wembley's opening is shining down on Arsenal's back four and they knock the ball around slowly to release Debuchy and launch an attack, snuffled out again. Reading's closing of space is impressive, they fill pockets and intercept with frequency. Hector pings one from their defence and that's a throw in high up the field. A breather for this industrious bunch. Have any pre-match expectations of a straight-forward Arsenal progression now been dismissed? Reading's endeavour all over the field is evident and Jordan Obita's cross has to be blocked by Debuchy after some nice passing in midfield by the Championship side. "Michael Hector has started the game really well. He looks confident and athletic. You can see why Premier League scouts would be interested. It's hard to believe that Reading are where they are in the Championship. They have some youth, some experience and some talent." Michael Hector is impressing in the Reading back line early on, sliding, jumping, covering, you name it. He has already won possession back three times for his side, though he has lost the ball on five occasions. Perhaps the 22-year-old is a spoiler and not an artist. Laurent Koscielny may have a shiner from Jamie Mackie - unintentional. It looks like an arm to the face. Alexis Sanchez may have a bruise or two too as he gets rumbled in midfield by a mixture of Garath McCleary and Nathaniel Chalobah. Nothing like a bit of rough and tumble. Good work ethic from Steve Clarke's side on show. Alexis Sanchez leaps like a frog at the back post to meet Mathieu Debuchy's cross but he cannot quite get enough pace on his header to beat Adam Federici. THIS TIME MAYBE, the Chilean is in from Cazorla's pass and out rushes Federici... Sanchez is there first and pushes the ball past the keeper, goes to ground, nothing given. There was no appeal from Arsenal but a hairy moment to say the least for Reading. Rapid stuff from Federici. Steve Carman: My 71-year-old mum is faster than Mertesacker. TheGasman: My Granny's quicker than Mertesaker! Peter Collins: Mertesacker with pace and tricks... What on earth happened to him? The Gunners have had around 77% of the ball so far and there's no doubt the clever touches that so often define their goals are on show, Aaron Ramsey nearly flicks an opening but a blue and white shirts is in the way. "You can tell Mesut Ozil is playing with more confidence. He is playing in the middle and wanting the ball more. "Francis Coquelin has been superb for Arsenal recently and is now probably one of their first names on the teamsheet. All credit to him for thinking his Arsenal career wasn't over and getting in the team." An un-Arsenal left footed hack upfield by Kieran Gibbs ends a scrappy Reading attack. So far their efforts going forward have lacked fluidity but there is enough hustle there to build hope of something happening if Arsene Wenger's side briefly tune out. The rhythm comes at the other end as Ozil interchanges and Cazorla curls one about three feet over from 20 yards. "I thought that free-kick from Mesut Ozil was going in and Adam Federici did too, plunging to the left of his goal. "It's been a pretty even game so far. Arsenal are edging it on possession but Reading do carry a threat. When they get the ball down out wide they look very dangerous." Arsenal have a free-kick in a glory area - central and around 30 yards from the net. Mesut Ozil fancies a bit of this, licking his lips he curls one just off target. The club's most expensive ever signing has some stage to impress on here. Does he have the needle to pick this Championship side apart? "Apart from the one attack from Arsenal, Reading should be very pleased with themselves. It is a positive start, they have got good numbers forward when they have attacked, but with Arsenal's quality and pace you always have to be switched on." Good work by Reading defender Michael Hector to cover and end Arsenal hopes of getting in behind. At 22, he will take that moment to settle some nerves. You get the sense these Reading players have had the seriousness of this Arsenal threat drilled into them all week. Their eyes are those of men on red alert. Wembley draws a breath after a frenetic start as Garath McCleary lines up a free-kick delivery. It's a big build-up, bodies in the area smuggle a clearance but only as far as Nathaniel Chalobah who volleys wide via a deflection. "Jamie Mackie is quicker than Per Mertesacker, and that's what Mackie is good at, using his pace and power to make the runs and that is something that Mertesacker does not enjoy." Jamie Mackie's heart skips a beat as he spins in behind, he can run clear at the Wembley goal can he? No. The flag goes up but it looks a disputable call and the energetic striker puts his hands on his heads. He saw the headlines briefly. Anyone looking for a premonition? Earlier this week Reading beat Arsenal in under-21 action. The goalscorer was Niall Keown, the son of a certain former Arsenal centre-half - Martin. Niall, 20, has already got his hands on the Premier League trophy. Here he is picture (left) with his old man back in 2004. "It's what we expected so far, with Arsenal dominating possession and Reading defending in numbers. Earlier Danny Welbeck was played through with a ball over the top and the Reading back two clearly can't keep up with him. That's why Welbeck has been selected to play today - for his pace." The Royals take the jabs and go counter-punch through Jordan Obita. A cross-field pass rolls into his path, why not? Whack. It's down the throat of Wojciech Szczesny from 25 yards and his handling is admirable. Wriggle, duck, roll, wriggle, Alexis Sanchez is up to his usual tricks to evade challenges in the area... finds space... shoots, corner. Here it comes... MERTESACKER... great save by Federici at his near post. He had to get down low to keep that header out on the line. Arsenal are on their toes, Reading taking some jabs. Danny Welbeck is in behind, chasing down a long clip from Kieran Gibbs... chance... good work by Adam Federici. The keeper is quick off the line, quicker than the rapid Welbeck and manages to palm the ball onto the striker, it deflects for a goal kick. A yard less zip on that ball and Welbeck was in. Reading adopt a rugby union stance and box Arsenal into their own corner early on but Jamie Mackie fells Alexis Sanchez to end the pressure. A chance for Danny Welbeck to stretch his legs down the left flank, here he goes, sets Alexis Sanchez but his driven cross-field pass is only ever going for a goal kick. Maybe even he is feeling the butterflies? "Mentally the players have to have had the right preparation, they have to have the balance between a steely determination to go and win while expressing yourself. You don't want any regrets. Give a good account of yourselves. "Arsenal will feel they can win it, bur Reading have nothing to lose today. They have to go and enjoy the occasion." The coin toss done, both these sides will attack their own fans in the second half. But they did, in 1973 on a muddy pie of a pitch in Sheffield. In the 42 years since, the Gunners have not lost a semi-final to a team outside the top flight. "No team in the Premier League has conceded more goals form corners than Arsenal, they are very static. If they do it right today Reading they will cause problems. Another way is catch Arsenal on the counterattack, get at them quick. It will at least give Reading a chance." The players stand in the tunnel. Arsenal in striped red and white tracksuits to the right of Reading players who are in their match shirts, no need for an over-layer for them. They stride, proudly out into the cauldron that is Wembley. Both crests are laid in the centre of each half, the handshakes come. We have four teams left in the FA Cup, let the storytelling it is so famous for end briefly, time for business. Final stretches, final discussions, inevitable nerves. The Reading changing room will be a hub of emotion right now. This is a team with no win in over a month remember, so they could be forgiven for being slightly fearful. What is Steve Clarke saying? Across the tunnel is a room full of household names, packed with players in superb form. Be patient, play your game, don't get dragged into anything, what is Arsene Wenger saying? Did you know: Next to the changing rooms in Wembley is a warm-up room. This has nets to protect the ceiling but is around the size of say three standard domestic garages. Players can get a little feel for the ball in there. "Reading will not be thinking about this as a day out, but as a chance to win against Arsenal. They were 4-0 up after 45 minutes in that League Cup game a few years back, and yes they went on to lose but it shows you can trouble them. "Reading need to make this the kind of game that suits them. They can handle the occasion, and they believe they can give Arsenal a hard time today. It looks like I didn't get the 'grey suit memo' and will be supporting colours today but I am impartial." Reading manager Steve Clarke: "We have to play the perfect game with no mistakes and find a way to score a goal. We have to find a way to be more creative. When we get into a good positions we need to produce moments of quality to score. "We go into the game with a bit of freedom, the pressure is on Arsenal. Everyone expects Arsenal to go though." "This is a game that Arsenal need to win. They have been on a magnificent win in the Premier League, but before that they had been under pressure with voices against Arsene Wenger. Without a doubt they are strong favourites here and you have to fancy them." "I replaced Wojciech because he had a bad game," Arsene Wenger contritely said in his news conference this week. He is right, goalkeeper Wojciech Szczesny's last league outing was against Southampton on 1 January and by golly he had a New Year's day to forget. Since then, only FA Cup duty has kept him busy as David Ospina filled the void but as today is cup-tastic, Szczesny is in net. "They know the rules. It is based on merit," added Wenger. "If you have a disastrous game you don't play in the next one. If Wojciech remained number one, Ospina would play on." So Arsenal have a cup goalkeeper. Is anyone else still confused by the merits of changing your goalkeeper for cup games? Are the goals bigger in cup games? Does the ball travel faster? "Came over from Perth for the game," Kieron Campbell told BBC Sport. "I'm Reading born and bred, but I've been over in Australia for 12 years now so I got hooked on Reading during the Elm Park days. "Moved over for my girlfriend at the time and she is now my wife. She's not a huge football supporter. 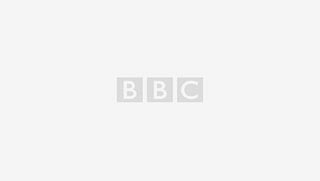 I listen to BBC Radio Berkshire every week to keep up with the games. My flight back in on Monday afternoon, this trip is purely for the FA Cup semi-final, I had no intention of doing it but I got carried away and I had a moment of realisation when I stopped over in Dubai and asked myself: 'why am I doing this?'. I'm not overly confident but hopefully it will be a great day. If we don't win I don't have to come back, if we do then I suspect I'll be back again." We have just done the maths, a round trip from Perth to London comes in at a shade under 18,000 miles. There is a sea of blue behind one of the goals at Wembley, it punctuates the red seating. Balloons, funny hats, the usual FA Cup paraphernalia can be seen as the warm-ups draw to a close. Coverage kicks off on BBC one in just one minute so turn the TV on and lap it up. "Its bittersweet to lose in an FA Cup semi-final. For me I think of Giggs' goal, it was a tremendous goal and I was proud to be involved in that match but it hurts. "Today the players need to conserve their energy, enjoy the occasion, turn up and go for it. I feel Reading have a real fighting chance today." Apu: Already seen Arsenal fans complaining about "too many changes", but its not like Szczesny, Debuchy, Gibbs and Welbeck are bad players. Here come the players, Theo Walcott is second in line as Arsenal step onto the pitch for a warm up. Per Mertesacker - who scored their crucial equaliser in the semi-final last year - is first out of the tunnel. He cannot wait to get out there, like a dog let off the lead. It's nice and warm, the huge structure that is Wembley creates a shade over most of the pitch but those players will soon have a sweat on. It may have the feel of a pending destruction - Premier League in-form side take on Championship outfit, but think on. The Gunners, chained and hampered by that long run without a trophy at this stage last year, ran into Wigan in the semi-finals and needed and 82nd minute equaliser and penalties to prevail. Oh yes, don't go big on too many one-sided predictions here. The FA Cup's last four loves to throw up a ding dong. Have a gander at this feature on semi-final battles if you don't believe me. Like Richard and Isobel in the previous entry, Reading's supporters have turned up en masse and are flooding Wembley Way as we speak. Try telling them on this day that the home of English football should not host semi-finals. One fan Reading fan I've spoken to named Richard will be at Wembley with his six-week year-old daughter (Isabel). He had to pay £43 for her seat. "It's Wembley we don't get there very often, particularly in the FA Cup so she is potentially the only person there who could get to see a another one." Without sounding harsh, Reading's FA Cup record is dismal. The Royals have never played in an FA Cup final in their 144-year history. They did make the semi-finals once but got thumped 3-0 by Cardiff City in 1927. I guess that makes today very special for several generations of supporters. What may feel like routine, obligation and expected for Arsenal is dream like, raw and undoubtedly nerve-filled for the Championship side. "Danny Welbeck has played more at Arsenal than he did at Manchester United, and he's had good form even if his goal scoring has not quite been up to the level you'd expect. The fans have taken to him. "He is very flexible, and his goal at United was such a sweet moment for him. I'm glad he celebrated it. Arsenal have such an array of fantastic attacking players but he is still contributing more than he was at Old Trafford." A notable omission from the Arsenal XI is Olivier Giroud who has five goals in his last five games. His place on the bench shifts some focus on to Danny Welbeck who will probably play through the middle for Arsenal - his favoured role. "Reading will play like supermen today, a lot of the players will have not played at Wembley. All the pressure will be on Arsene Wenger and Arsenal. They will be expecting an Arsenal win but will not have an easy ride. Reading and Steve Clarke will be right up for it." Reading's players are having a walk on the turf, gazing into the red seats to look for recognisable faces. Jordan Obita, at just 21, was keen to take it all in. No goals for him in 46 games this season. Talk about the stuff of dreams if he broke his duck here.